When I woke up this morning I didn't have much to look forward to besides a possible trip to the laundromat and Costco. Then, around 9:30, I saw a Tweet from Cameron (greengoody) that Tony Hawk hid a skateboard behind a fire hydrant for his local followers to find. I clicked over to his profile and read that the board was on a street very close to my house. I jumped out of my chair, left my breakfast and chai latte and literally ran out of my slippers in my haste to get up the stairs. Like any good blogger, I grabbed my camera and my Flip and hopped in the car thinking how stoked Drama Kid would be when he got home from school today. Naturally, I caught every. single. light on the way there! I turned onto the street right behind two other guys. The look on their faces was priceless. I'm not sure they turned their car off. It jerked to a stop, both doors flew open and the younger guy went thrashing through the bushes just in case case Mr. Hawk decided to be sneaky. The older guy was on his cell asking if anyone Tweeted that it had been found. We both laughed that we weren't able to keep up on what was happening because neither of us were connected to the web. I'm not sure how far behind the winner I was, but I know I wasn't the only one who got a late start. A few other locals sent out Tweets that they had just missed it too. So, thank you Mr. Hawk for bringing a little excitement into my morning. And for any business or company that has yet to see the benefits of social media, Tony Hawk proved today that there are creative ways to market yourself that are engaging, low-cost and beneficial to your customers. *CLOSED* Let's start the week off with a giveaway. I had an opportunity to try the new Guiltless Grill menu items from Chili's through Bzz Agent. It was nice to be able to treat my mom to lunch for a change, especially since she took such great care of me the next few days after my wisdom teeth were pulled. Take a look at the short video, we each had a different entree (sorry for the weird angles, you may need to up the volume). Since we were so good with lunch we decided it couldn't hurt to have a little dessert. Those Sweet Shots are genius! We had Key Lime Pie, Red Velvet Cake and Double Chocolate Fudge Brownie. 1. We went from guiltless to guilty with the dessert (but it was so worth it!). To enter, leave me a comment with your guilty pleasure (required). That's it! 2. One winner will receive two coupons for a free Chili's Guiltless Grill entree (they expire 5/31). 4. I MUST have a way to get in touch with you! NoReply@Blogger will not send you a response. I will have to delete comments with no contact info.You can leave your email address in the myemail [at] thisaddress [dot] com format to prevent spam. 5. Comments will close on Friday, April 3rd at 11:59pm CA time. 6. I will use random.org to draw the winner and post the results/notify winners via email, Twitter and in a "Winner" post on Saturday 4/4. 7. Winner will have until Monday, 4/6 to respond or a new winner will be chosen. A Post about Nothing, But on Video! This is my second attempt at PROMPTuesday. This week's theme, love, is extra special and important because someone I like, admire and think is SO funny is soon to be affianced, but doesn't know it yet. Secret surprises are awesome! If you'd like to get in on the love, and write your own PROMPT, go visit my SFAM (sistah from another mister) Deb and read the rules. This is a short story, with a moral, but one I've not told here before. I mentioned in my 10-year anniversary post that I proposed to Phil. When we got "engaged," we were living in a two-bedroom apartment in Ocean Beach. One of his Navy buddies was our roommate. Phil was at sea, our roommate was heading out shortly after and their ships were scheduled to cross paths in Hawaii. Phil was coming home for his sister's wedding in a few weeks and I would pick him up at March Air Force Base. Before our roommate left, I went to Victoria's Secret and bought a small bit of lace, sprayed it with Phil's favorite perfume and wrapped it in tissue paper. I gave the package to our roommate along with a note that read, "Bring these with you when I pick you up because I won't be wearing any," and asked him to give it to Phil when he saw him. A few weeks later, on Friday, September 4th, 1998, with no undies on, I asked Phil to marry me. Relationships can be hard. Marriage, a good strong one, takes effort and work. But never forget to keep it fun! If you want to participate in Proposal 2.0, write a post about love, marriage, your engagement story or best relationship advice you've ever received and add it to the Mr. Linky here. *Update* 3/25 She said YES!!!!! I'm in recovery hell. I hurt and will be going back to bed soon. I'm under the influence, sorry if this doesn't make sense. I woke up early Saturday with my stomach growling. I'd tried to eat a big dinner Friday night, but I guess I danced it all off at The Belly Up. When I got to the office they were running behind. There was a sweet older couple in the lobby. They were speaking to each other really loudly and it gave the rest of us a chuckle. Finally they call me back. I was hoping to be immediately greeted with a gas mask and then peeled off the floor. No such luck. While I'm waiting, the little old woman from the lobby goes under. She's in the chair to my left. I can't see but I can hear everything. I'm in the chair hungry, tired and nervous. She starts moaning and screaming. They have to ask her repeatedly to keep her hands down and to breathe through her nose. Then the drilling starts. Sweet Baby Jesus the drilling! I fully expected to see the staff walking around in those hard hats with the protectors to keep the sparks off their faces. And the suction! Good lord it sounded like they were sucking off her whole face! And all the while the beeping of the heart monitor she was attached to was so irregular, at times I was afraid a trip to dentist would turn into a Grey's Anatomy episode but without the McDoctors. It was awful! I was trying to relax and breathe but listening to her did nothing for my nerves*. I was in the chair so long, her procedure ended and another person sat down. She was a teenager with her mom. 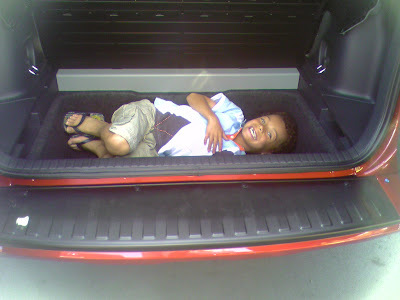 She was crying and begging to be put under but her mom said no. Her mom told the hygienist that she had a friend who went under and is now permanently in a wheelchair and she didn't want her daughter to be put to sleep. Great. I hadn't even thought about paralyzation! Finally, it's my turn and I can't wait for the drugs so I don't have to hear anymore. Once they gave me the sedative I didn't even have time to count back from 10 to 9. When I woke up, they hustled me right out the back through the storage room. I don't remember getting in the car or handing her the camera but my mom took this video (blood alert, consider yourself warned). I put tea bags in my mouth to help the clotting. I've spent the weekend mostly in bed eating cut up noodles, smashed bananas, pudding and drinking microwaved smoothies (to take the chill off). The doctor warned me that I may have small holes in my sinus cavities because the upper teeth were so impacted. And I think he was right. When I swish the mouth rinse my sinuses burn. Also, my glands are swelling. I'm waiting for the dentist's office to call me back. Infection? I'm going back to bed. *I found out later that the woman is 96. They couldn't put her all the way under because it's too dangerous with someone her age. I feel bad for wishing she'd shut the hell up and get hold of herself. Even though living in So Cal means we get to be outside year round, I love spring and summer because of how long the days are. I told Drama Kid a few days ago that we're going to be spending more time outside after school. Today he took me at my word and kicked off his shoes and socks as soon as we pulled into the drive and started playing with his tether ball. We had about two hours for snacks and playtime before martial arts. Having been out of the house for most of the day I was anxious to re-enter the Land of Always On Wireless and check Twitter emails. Our house is two levels, but not the typical split level. The front door opens to the family room with the dining room and kitchen to the left. The bedrooms and secondary baths are downstairs at the back of the house. The computer is in the spare bedroom. It took awhile to get used to, but after two scorching summers I'd much rather sleep downstairs. But I digress. My little guy has always been independent, fearless and I-will-not-stop-moving-until-I'm asleep active. I've tried to encourage him and not stifle these traits. As much as they scare the heck out of me at times, I know how important and valuable they will be to him as he gets older. Even when he was little I wasn't the type of mom to follow him all over the playground and go down the slide with him in my lap. I didn't want my worryness to rub off and make him timid or overly cautious. 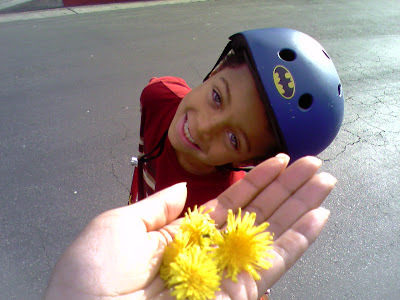 Now that he's getting older, I am trying (not always successfully) to cut the apron strings more and more. A few weeks ago we were at the park and he started doing the pee dance. The other boy he was playing with also had to go so his dad and I headed to the bathrooms. Drama Kid followed the boy and his dad into the men's room. I was a nervous wreck. Even though I could hear him and he was with an adult, it still felt wrong. So now I'm in a quandary. I was the one who said we'd be increasing our outside time, but I can't keep an eye on him and be productive at the same time. Today I had the front door open, along with the garage door and the door leading into the kitchen, and the window in DK's bedroom since his room is on the side of the house and I could hear him if he was in the front patch of grass yard. And, God love the kid, he put out the "slow, children at play" sign all by himself. But if he went down the driveway, or across the cul de sac to the open space, I couldn't hear him at all. I spent a lot of time running up and down the stairs to check on him and didn't get a whole lot done (which is why I'm writing this post at midnight). How do I balance productivity with safety? By the time we got home from martial arts it was time for homework, dinner and bedtime. 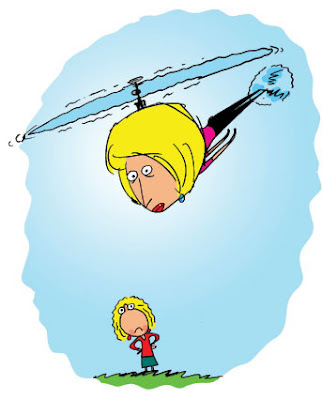 Am I being Paranoid Helicopter Mom? Do you stay outside with your kids? How old were they before you started giving them a little more freedom? [Insert obligatory when I was a kid I wandered the neighborhood barefoot until the street lights came on story here] Am I doomed to spend the summer catching up on my blogging commitments after everyone else is in bed? 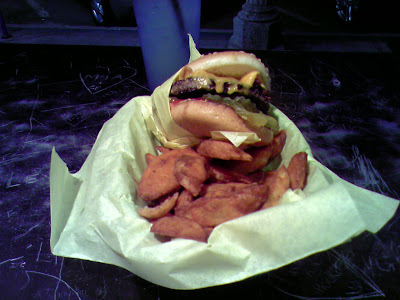 ... is at Hodad's in Ocean Beach. Flipping through the April issue of Glamour magazine this morning I saw something in an ad that made me happy. Thank you Maybelline for offering a full range of skin colors in your liquid mousse foundation samples. I've always been turned off when I see the ads with samples attached that are of zero use to me. If I can't try something before I buy it, I'm not going to bother. I've been there, done that with buying makeup, trying it at home and getting frustrated when it doesn't match my skin tone.To be perfectly honest, I don't wear "drugstore" cosmetics like Maybelline and Covergirl is for this exact reason. I have a feeling I'm not alone. So kudos to you for at least giving me the option. I shouldn't have to subscribe to Ebony or Essence magazines to find the latest trends in skincare and makeup and try them on. It's exclusionary, plain and simple. I get that magazines spend thousands of dollars in research to determine who their target audience is. And, I get that makeup companies want to put their product samples into the hands of someone most likely to buy them. But, perhaps cosmetics companies should spend some of those dollars to find out who's NOT buying, and why. Two weeks ago I helped my son with his first school report. Why first graders need to do reports is beyond me, but I decided to take the opportunity to show him how to do research and write a rough draft. The topic was animals. The students could choose whatever animal they wished and answer questions like, "does your animal migrate?" and "where does your animal live?" 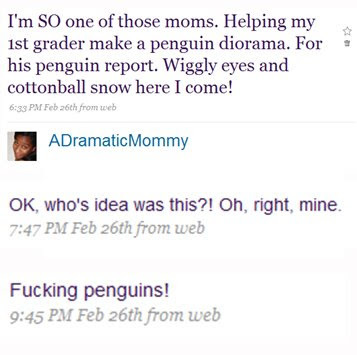 For whatever reason Drama Kid chose penguins. My crazy busy week kept me from taking him to the library to look up reference books so we took the easy way out and printed information from Google searches. Another part of the assignment was to draw pictures of the animal and bring in other pictures of the animal. Not having any Penguin Weekly's lying around I decided to do a craft project (stop laughing!). Naturally, I turned to my internet luvah and sent a Tweet asking if anyone could think of a project I could do with penguins. I got several good suggestions. Mommy's Martini suggested I put feet and wings on a blown out egg. Since I don't even eat eggs there was no way I was going to put my mouth on a raw one. But, I did like the idea of going three dimensional. When I picked the kid up from school we headed to crafters hell (also known as Michaels) in search of something we could make into a penguin. My thought was to find the styrofoam egg shapes, add penguin parts and googly eyes and call it a day. But then, my competitive nature and good study habits took over and the word diorama neon flashed in my brain and we had to find just the right thing to make the penguin out of. I started to picture a painted backdrop, cotton for snow and a cute little penguin front and center. What fun this would be! I'd help the kid with his first school project and we'd bond and have fun over a converted shoebox. Oh how quickly that dream turned into a nightmare! First, let me say to Michaels: It seems kinda obvious to me that the early evening hours, the ones right after school where kids are telling their parents about the big projects they have due? Would be the appropriate time to have more than four people on staff. And what's up with the missing apostrophe? After helping another parent find the stencils, I practically tackled a guy and begged him to help me flesh out my idea. He was an angel! He walked all over the aisles with us pointing out various diorama makings and offering suggestions. Which we didn't take, but it was still very nice of him to take the time. It was Drama Kid who happened to find the main component for the diorama. We went to to discount aisle (foam egg shapes are $3.50 a piece!) and found puzzles made from thin wood. I told him to get searching and he dug through the bins and found the penguin set. 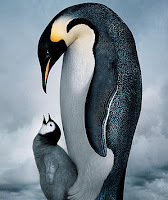 The puzzle made two penguins, an adult and a baby, and when put together would be three dimensional. The wood could be painted (yeah, right) or colored with markers. The picture looked simple enough and for $2 the price was exactly right. After an hour in Crafters Hell we were ready to go. We get home a little after 6:00, I assemble the shoe box, paint and cotton balls, start dinner and open the puzzle to read the directions. And realize I'm totally screwed. What looked so simple from the picture turned out to be a project for someone with an engineering degree. The directions were a joke, the pieces left wood shavings all over and I had to sand some down to keep from getting splinters. Fast forward two hours and a few frustrated Tweets and it's time to get the kid in bed and the stupid penguin is only half put together. I'm totally ready to give up, but then we'd not be completing the assignment and the nerd in me just couldn't do it. Hubby did help me with the last few pieces (there was one left over) and the damn thing was finished long after the kid had fallen asleep. Before I had a kid, I said I didn't want to be one of 'those' parents who did their kids' entire homework projects for them. Fail! But, it wasn't Drama Kid's fault that his mommy had such lofty ideas with no skills to back them up! And he did the painting, cutting and gluing. The next day I walked him to class carrying his backpack so he could carry his project himself. He told me at pick up that he was the only one who did something like that and I could tell he was so proud. I would gladly suffer more splinters to see that look on his face again. Student Loan Debt- Should It Be Forgiven? Last week I followed a Tweet from GeorgeGSmithJr to an article on The Huffington Post. The topic is forgiving student loan debt to help stimulate the economy. An attorney from New York has started a petition on Facebook to cancel loans so that those monies can be injected back into the economy. The comments on the article are interesting and range from (and I'm paraphrasing) "Why not help those who are struggling?" and "If bankers can buy $40,000 chairs then why not?" to "No way! You willingly took out the loans, they should be paid back in full." George and I had a conversation where I said that I didn't want to be seen as a deadbeat. The loans are my responsibility but the monthly payment amount is one we just can't swing right now. I spoke with the Department of Education about my loans just last week. They've advised me on the best course of action given our situation. I'll be keeping the loans in forbearance status but making a payment we can afford which will go more towards the principal than the interest. I think the petition has some merit and is worth further investigation. I don't think loans need to be entirely forgiven but drastically reducing the interest rates, forgiving the interest that has accrued to date or allowing people to volunteer to work off the debt are ideas I think the government should at least look into. The idea of fairness and whether this type of plan would actually help stimulate the economy is a slippery slope for sure. But so many people I know bought into the idea that we needed to go to college or else we'd be failures, and we went to college thinking we'd definitely be able to pay back the loans easily because a degree automatically guarantees a good job. I can't speak for anyone else but the monthly payment the bank wants would take a huge chunk of our monthly expenses. 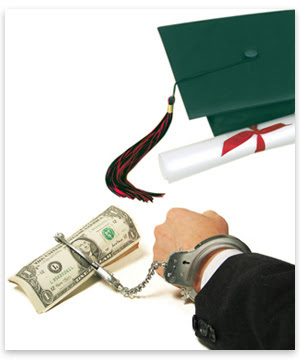 Are you weighed down by student loan debt? Have you found a payment option that works well for you? What do think of the petition? I can't drink regular coffee. It has to be flavored. I can't drink coffee with out creamer (half and half too, but I can live with out it). My creamer has to be the same flavor as the coffee or I can't drink it. French Vanilla coffee = French Vanilla Creamer. What are your random quirks?